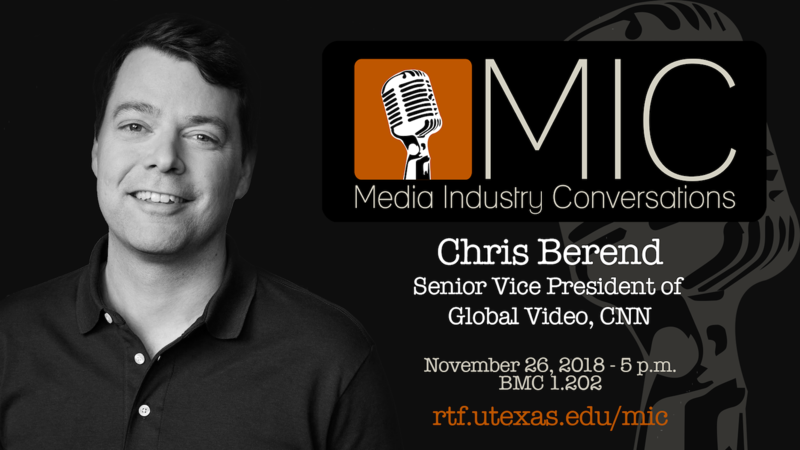 When: Monday, November 26, 2018 - 5-6:15 p.m.
Chris Berend (English BA ‘07) discussed his career trajectory, his responsibilities as the Senior Vice President of Global Video at CNN, his role as co-founder of Great Big Story, and his views on the current state of digital storytelling and video content. Chris Berend is a senior vice president for CNN, overseeing all digital video content for the network including the premium content house of CNN Digital Studios. He is also the co-founder of Great Big Story. Berend oversees CNN Digital's global strategy to be the worldwide leader in video news, and under his leadership CNN Digital has been the #1 digital video platform since April 2015. Berend manages all digital video operations at CNN including breaking news, feature content and original premium series overseeing staff in bureaus around the globe. As co-founder of Great Big Story, Berend oversees strategy and operations from editorial to product and audience development. After launching in October of 2015, Great Big Story grew quickly into a global media company of its own -- telling more than a thousand stories from 75 countries around the world. Before joining CNN, Berend was the head of video for the Bloomberg Media Group, and oversaw video development and production for Bloomberg's web, mobile, television and syndication platforms. Prior to Bloomberg, Chris spent six years at ESPN where he served as senior director of content development and earlier as deputy editor for ESPN.com Insider and ESPN magazine. He began his journalism career at Esquire Magazine, where he spent nine years in various feature editorial roles. Berend received his undergraduate degree in English from the University of Texas at Austin.